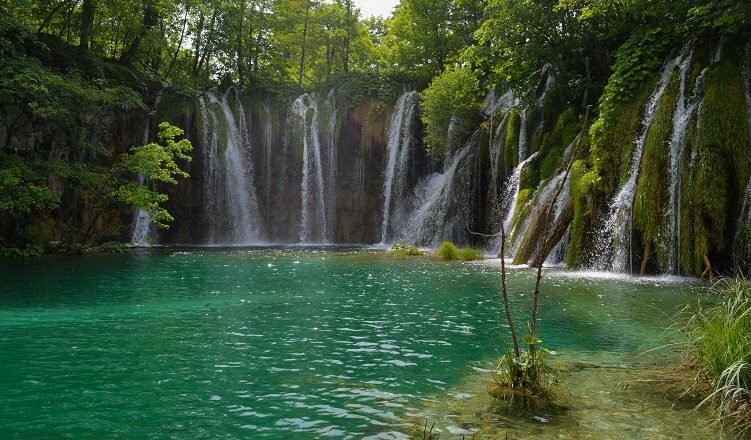 Ever since I got Pinterest, I’ve been seeing pictures of Plitvice Lakes National Park in Croatia, which is wondrous place where 16 lakes meet creating hundreds of waterfalls cascading above, below, and everywhere around you. So I was pretty sure it was something I wanted to do at some point in my life. But when I very loosely planned my European escape, I realized the park is somewhere in the middle of Croatia and I knew how to get to Zagreb and Split. Frankly, if I had tried a little harder, I would have figured it out. But as it turns out, I didn’t need to. Immediately upon arriving in Zagreb, we were bombarded with day trip options to the park. We opted for the path of least resistance and got a tour that we could book through our hostel and would pick us up there, through Wanderer Traveller. You can choose a guided tour or an unguided tour, a tour that is one way or one that brings you back to Zagreb. If you are heading down to the beaches, there are some versions of the tour that stop in Plitvice Lakes and continue to Split (which is what we should have done but didn’t). We chose the unguided route because according to many tourist tips, the park is pretty self-explanatory, and easy to navigate. I always like the freedom to stop and go when I want without having to keep up with a group so we essentially paid for the transportation to and from the park which amounted to about $30 per person. As unguided visitors, we had to purchase our own tickets. It’s about $16 for adults and around $11 if you are a student or have an old student ID that you can still pass off as current. Overall, not an extravagant cost for a really amazing experience. This beautiful dog agrees that it’s amazing. That being said, there were downsides to the tour bus. We were picked up at 8 am in a little van that proceeded to get into an accident on the way to the tour agency. From there, other people joined us at the agency and we boarded a huge coach bus. That bus spent an hour in Zagreb traffic picking other people up. So what we thought would be a short 2 hour drive to Plitvice Lakes ended up being 3.5 hours, including a stop for breakfast. Public transportation options are probably cheaper and quicker, but again… path of least resistance. Once we arrived, the tour manager gave us some instructions on how to best enjoy the park and told us where to meet him at the end of the day and we were on our own. The park is fairly large and probably the kind of place it takes a whole day or two to see in its entirety. On our visit, the lower lakes were blocked because of flooding, but we were still able to see the best parts of the lakes, according to our tour manager. We followed his instructions successfully and were able to see most of the highlights throughout the park. 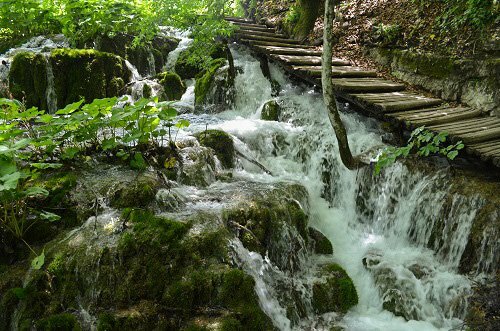 One of things that intimidated me about Plitvice Lakes is that the paths, which go over water, are made of wood and don’t have any guardrails. 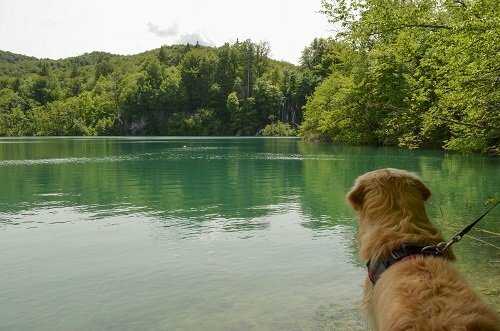 And as beautiful as Plitvice Lakes was to visit, I had no intention of drowning there. But the paths were not as scary in person as they appear in pictures. It helped that we were visiting in the beginning of June when high tourist season has not yet kicked off. I can imagine being cramped on those boards is a bit of a nightmare if you’re packed like sardines. But for us it was mostly empty, save for a few precarious spots here or there, like when we ran into an entire high school class on a field trip on the edge of a deep ravine. You certainly don’t want to be stuck on the precipice of that traffic jam but we were and we survived. You probably will, too. There are posted trails all over the park, according to the desired length of your stay and can be anywhere from 1-2 hours to 6-8 hours. But I’ll share with you the route our guide told us to take because it served us well. There are two entrances to the park. 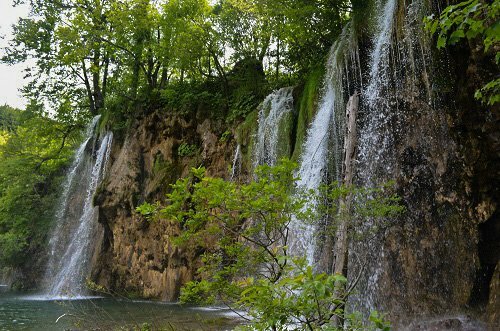 Immediately when you get into the park through entrance 1, you’ll see the big waterfall, Veliki Slap, which provides awesome motivation to continue hiking for 3 or 4 hours. The park is so big that it has its own internal mode of transportation. There are trams and ferry boats. We walked up to tram station 1, where you board a bus that takes you to station 2. At both of these station areas, there are bathrooms and food. On the walk between station 1 and 2, you’ll have a bird’s eye view of the lakes. All the pictures you’ve probably seen of Plitvice Lakes which show the falls cascading into beautiful clear blue waters with people walking on those precarious looking wooden paths… That’s where you will see that view. It was a nice surprise because I was sure you had to be in a helicopter to see that. Bird’s eye view of the park. The trams that move you from one place to the other are fairly large, though I imagine they get crowded during the busy summer months. Between the ride up and down the hills and waiting for the trams at both station 1 and 2, you’ll probably spend a total of 35-45 minutes getting to the top to station 3. Once you get to tram station 3, you have two paths, one to the right that starts going back down to the entrances immediately and one to the left that goes the long way back down. Take the long road. You’ll immediately be on the wooden boardwalks snaking around the falls. The path is fairly wide so you never really feel like you’re about to fall over. Most of the time, the path is over shallow water. By the time you get to the part of the falls where you take wooden steps down to another platform while waterfalls rush beneath your feet, you pretty much stop caring about your silly fears. Go with the flow and you won’t even remember you’re walking on jagged pieces of wood. Since there was flooding, some routes in the path led to dead ends, and some parts of the wooden path were reinforced with pieces of wood to create a higher, dry place to step. They do a good job of maintaining the park safe to navigate. Despite that, some parts of the walk are a little wet because of the giant waterfalls cascading right next to path. Outside of the wooden path, you’ll also encounter slippery rocks on the dirt paths with a higher vantage point. So wear shoes with good grip and enjoy. We pretty much followed all the signs that led to dock 2 (P2 on the map), where you can take a ferry boat to dock 1 (P1) or 3 (P3). Dock 3 is a little farther out, near entrance 1 and would probably have extended our stay in the park far longer than our tour bus would allow. From dock 2, we took a very short ferry back to dock 1, which is a short walk to the second entrance of the park, where we exited. Unlike almost everywhere else in Croatia, you can pay with a credit card at the park entrance. But snacks and water throughout the park (at any one of the main stops), will require cash. Despite what we read about being able to refill water bottles all over the park, unless they meant with lake water or in the bathrooms, we found no water refill stations. So bring a lot of water with you. Bring lunch. There’s a good chance you’ll be somewhere in the thick of the park when hunger strikes without a quick route back to food. There are benches and nooks along the path where you can sit down for a snack and enjoy the view. Use the restroom whenever you can. You want your bladder empty when you’re surrounded by the sound of rushing waterfalls. You can’t swim in the lakes or stand under the waterfalls, because it’s a UNESCO World Heritage Site. But they sell beer, so bless them for that.